"Defense Logistics and National Security," a seminar by retired Lieutenant General Claude V. Christianson will be presented Wednesday, Jan. 30, at 3 p.m. in the Arikara Room of the NDSU Memorial Union. Describing the essential educational outcomes required to prepare and sustain defense logistics leadership for the changing global environment. 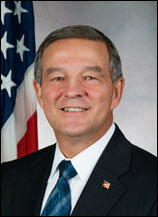 The seminar will offer perspective from Christianson's current position as director of the Center for Joint and Strategic Logistics at the National Defense University and from a 37-year military career that culminated in his service as director for logistics at the Joint Staff in Washington, D.C.
With the Joint Staff, Christianson synchronized joint logistics support across all services and Department of Defense agencies in support of operations worldwide. Under Christianson's leadership, the Center for Joint and Strategic Logistics, formed in 2009, is becoming the foremost organization for the study of logistics in support of national security in the U.S. Christianson, originally from Forest River, ND, holds a B.S. in industrial engineering from North Dakota State University and is also a distinguished military graduate of the Army ROTC program at NDSU. As the Army's Deputy Chief of Staff for Logistics, Christianson drove deployment of a commercially-sourced satellite network to connect forward-deployed logisticians. He also served as the Chief of Logistics, Coalition Land Forces Command during Operation Iraqi Freedom in Kuwait from 2002-2003 where he directed the planning and execution of logistics support for more than 240,000 ground forces over more than 300,000 square miles. Prior to the Kuwait assignment, Christianson was assistant chief of staff for logistics for the United Nations Command with the Eighth U.S. Army in Korea, directing the planning and execution of logistics operations in support of all combined and joint forces in Korea. Christianson began his military career in 1971, assigned to the 1st Infantry Division where he gained early leadership experience with infantry and maintenance battalions. His highest awards and decorations include the Distinguished Service Medal, Defense Superior Service Medal, Legion of Merit, Bronze Star Medal, Meritorious Service Medal, Armed Forces Expeditionary Medal, and the Global War on Terrorism Expeditionary Medal.